Do you like to sing while you are taking a shower? If the answer is yes, then it would be nice to have a backup soundtrack to accompany your beautiful vocals! Shower radios can help you relax by playing the songs you love from your favorite streaming service or from the radio. Listening to music in the shower is a great way to unwind. There are many features available in shower radios from LED lighting to timers. It’s hard to choose a specific radio when so many options exist. We have reviewed 8 of our top favorite picks for you below in hopes this will help you make an informed decision on the best shower radio to buy. 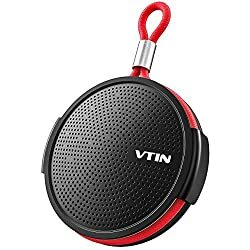 If you want a shower speaker that has bluetooth and offers long playing time, then consider this Vtin portable waterproof shower speaker. It is equipped with bluetooth 4.2 which will work within 33 feet of the speaker. Although this speaker is water-resistant it should never be immersed completely into water for a long time. Four multi-function buttons on the bottom of the speaker let you change the song and adjust the volume. This speaker can play up to 10-hours straight on a full charge. The battery takes about 2.5-hours to charge using the included USB charging cable. This wireless speaker weighs 9.6 ounces and can easily hang in the shower with the suction cup hook that comes with this product. You can use a microSD card with this speaker giving you even more options for playing countless hours of music. This Vtin wireless speaker is a perfect addition to your bathroom or you can use it as a gift for someone else. This tiny bluetooth speaker will not leave you disappointed! 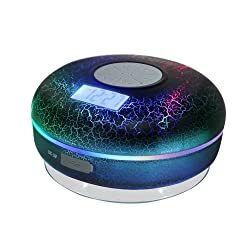 This bluetooth speaker will light up your shower with LED mood lighting and take your shower experience to a new level. It has a built-in microphone for hands-free speakerphone calling and has a total music playback time of 8-hours on a full charge. 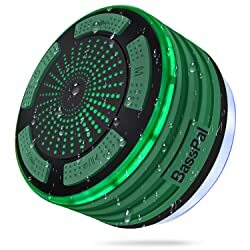 I like this speaker because it is fully waterproof with an IPX7 rating which means you can submerge it in 1 meter of water for up to 30 minutes! This makes it a perfect bluetooth speaker for the shower and you don’t have to worry about it getting too wet. You can even use this speaker in the pool and let it float on the water while it is playing music. The bluetooth in this speaker has a range of 33 feet. It also includes a built-in FM radio and even a microphone. This speaker has an auto-off feature that will shutdown after 15 minutes of inactivity. BassPal offers a 30-day money-back guarantee for this product for any reason. This makes it a risk-free choice in shower speakers. The HB Illumination speaker is a perfect choice for your shower. It has a built-in FM radio and uses bluetooth 4.0 with a 24-foot range for up-to-date wireless technology. It has an IPX7 waterproof rating which means it can be submerged in 1 meter of water for up to 30 minutes. The built-in microphone allows you to make hands-free calls through the speaker even while you are taking a shower! With 10 LED mood lights, you can create the perfect ambiance in your shower and set the mood for a relaxing spa-like experience. Besides being waterproof, this speaker is also shockproof and dustproof. 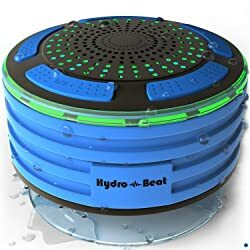 Hydro-Beat has designed this speaker to float so you can even use this in the pool and play music for everyone to hear. You can get 6-hours of playback time with this speaker on a full charge. It only takes 3-hours to recharge the battery so it’s quickly ready for you to use again. The 12-month warranty offered by Hydro-Beat makes this a smart choice in shower speakers. This shower speaker from BassPal will bring your shower experience to life with multi-color LED lights and music. You can create a relaxing environment with soft music by connecting it to your phone or other device using a bluetooth 4.0 connection. It also features an FM radio so you can tune in and listen to your favorite local station. The speaker has a waterproof rating of IPX7 which means you can submerge it in 1 meter of water for up to 30 minutes. The hands-free built-in microphone lets you conveniently pick up calls directly through the wireless speaker when it’s connected to your Smartphone. 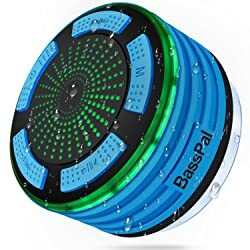 This BassPal speaker has an automatic shut-off feature which will turn the speaker off after 15 minutes of inactivity. It has up to 8-hours of playing time on a fully charged battery. BassPal offers a 24-month warranty so you can buy this speaker with confidence knowing any issues with the product will be resolved. 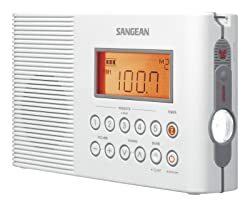 If you like to listen to the radio while you are taking a shower, then consider the Sangean H201 shower radio. This product has a built-in AM/FM antenna with PLL (phased-locked loop) digital tuning. You have ten station presets available to save your favorite stations for easy accessibility. The auto seek function allows you to scan for the next available radio station without having to scroll through each of the frequencies. The large easy-to-read back-lit LCD screen allows you to see which station you are currently listening to in the shower. This product has the Japanese JIS7 Standard rating which meets waterproofing standards equivalent to Marine radios. The radio will even float if you drop it into the water! You can also set a timer on this radio from 1 to 120 minutes. Sangean offers a 1-year limited warranty on this shower radio product. This classic radio allows you to listen to your favorite radio stations while taking a shower. The product is splash-proof and comes with a detachable strap so you can hang the radio from the shower arm or shower curtain rod. It has a built-in AM/FM radio receiver, and the 5 preset buttons on the radio allow you to program in your favorite stations. This allows you to tune into a specific station at a later time. This radio will operate for up to 100-hours using 3 C batteries. The countdown time feature allows you to set an alarm after a specific amount of time. This is a great way to make sure you do not spend more time in the shower than you have available! The programmable auto-off feature will allow you to specify in minutes how long you want the radio to remain on. Sony offers a 1-year limited warranty on this product. If you want a simple radio for your shower, then this shower radio is a budget-friendly choice for you to consider. This shower speaker from Hromen has a cracking or lightening-style multi-color back-lit display. The colorful display will keep you entertained while you are listening your favorite songs in the shower. 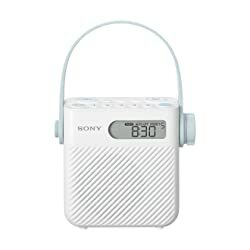 You can listen to stations using the FM radio or you can connect it to your Smartphone or other device using bluetooth. This radio has 30 station presets so you can save all of your favorite stations. It has a built-in clock which will show time for up to 20-days without shutting it off. This product has an IPX7 waterproof rating so you can drop this in the water without worrying about it being ruined. The rechargeable battery capacity will last for up to 8-hours and you can easily recharge the radio with the fast charging cable. If you are looking for a fun, practical and economic radio and speaker for your bathroom, consider this fabulous product from Hromen! This Sony Shower Mate radio is splash-resistant and offers AM/FM radio bands and weather. You can program five preset buttons and set them to your favorite stations. This radio has a 90-minute timer with five available timer presets. The auto-off function makes sure you do not leave the radio on for long periods at a time. The Shower Mate has an oval shape and is constructed of white plastic. This shower radio is not waterproof or water-resistant. You do not want to hang it directly in the stream of water. This product requires three C batteries for operation. For many individuals, taking a shower is a time to relax after a long hard day at work. Other people take showers in the morning to energize and wake them up before heading into a busy day. Regardless of which category you fall into, you can use a shower radio to relax or energize you. It can keep you entertained and also keep you up-to-date on current news and world events. Before you decide on a specific shower radio to buy, there are several features you should consider. Most of the shower radios on the market include a bluetooth feature which allows you to connect your Smartphone or other device to the radio speaker. Some shower radios only have AM/FM bands and cannot connect to any other device. If you like to only listen to the radio, then a non-bluetooth capable radio should be adequate for what you need. If you like to listen to streaming services, however, you need to be sure the shower radio you consider can connect to another device via bluetooth. Be sure you understand how the radio will pair with your device as not all bluetooth devices are compatible. The sound capabilities of a shower radio can give you a positive listening experience in the shower or it can completely ruin your shower. It is important that you can increase or decrease the speaker volume while you are in the shower. The volume buttons should be in a position that are easily accessible on the speaker. You want to make sure you can hear the speaker over the sound of running water in your shower. Read reviews on the product you are interested in so you can make sure that the sound quality will not be an issue. 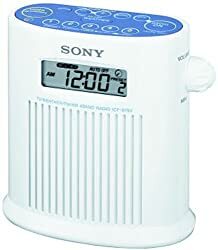 If you like to limit the amount of time you spend in the shower, then consider a shower radio that has a timer feature. This will allow you to set the timer for a specific number of minutes and then have an alarm sound when the time is up. Timers are also useful in other areas of the house such as the kitchen. You can always buy a shower radio you can use in other parts of the house for timer and listening purposes. As you review shower radios, you will quickly notice that most shower radios do not have a clock feature. If this is an important feature, you may need to search specifically for shower radios with a clock. This will help narrow down your search results and provide you with specific products that will suit your needs. Some shower radios have a weather feature that receives NOAA (National Oceanic and Atmospheric Administration) weather channels and reports. If you live in an area where weather updates are important, consider a shower radio that has this feature. Be careful when selecting a product that claims to have a weather feature. Some shower radios advertise the ability to have weather alerts, but they do not let you know the radio must be manually tuned to a specific weather channel for the alerts to be heard. Before you buy a specific radio with a weather feature, do your research on the product and be sure it really is connected with NOAA reports. The shower radio you decide to buy needs to fit in with your shower configuration and layout. Some shower radios have a string or cord that you can use to hang it from the shower arm. Other shower radios have a suction cup will stick on the wall. Some suction cups do not hold suction well, however, so be sure you read reviews on the product before you choose to buy it. The design of some shower radios require them to be placed on a shelf or other flat surface. You need to make sure this type of radio can fit in your shower. There are shower radios that claim to be water-resistant, but cannot tolerate any direct water contact at all. Unless the product is given a specific IP (International Protection) code, such as IPX7, you can be sure that it has not been tested against the standard waterproof classifications. Some products that are made in other companies may provide waterproof ratings specific to the country of manufacture. In this case, you should do some research to understand what that country rating represents in terms of waterproof protection. As you can tell, there are many features to consider before you buy a shower radio. There are many options available, but you should choose one that fits in best with your shower configuration, your lifestyle, and your needs. Our product reviews and feature guidelines should give you all the information you need to make an informed decision.